The pattern of arrangement of atoms in a crystal, called the crystal lattice, can have a huge effect on the properties of solid materials. Controlling and harnessing these properties is a challenge that promises rewards in applications such as novel sensors and new solid-state devices. 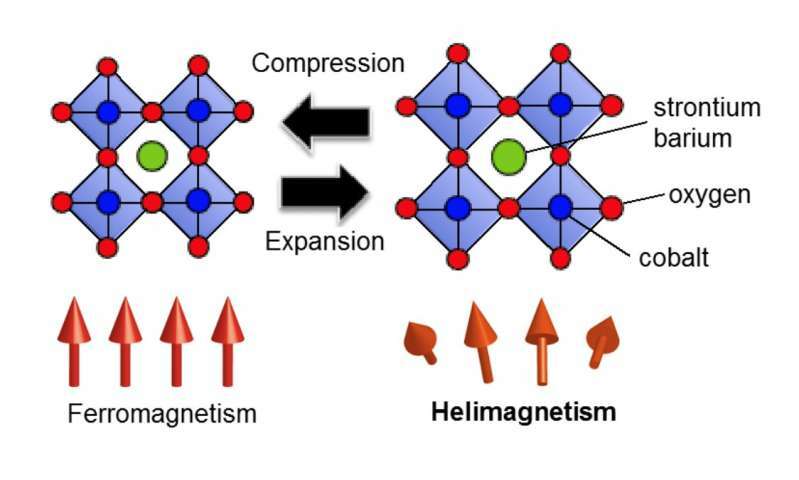 An international research collaboration, including researchers from Osaka University, has reported the induction of an interesting type of magnetic order, called helimagnetism, in a cobalt oxide material by expanding its lattice structure. Their findings were published in Physical Review Materials. Magnetic behavior results from the order of the magnetic moments of the many individual atoms in a material. In helimagnetism, instead of the magnetic moments being aligned—as they are in permanent magnets, producing ferromagnetism—the moments arrange themselves in a helical pattern. This behavior is generally only observed in complicated lattice structures where different types of magnetic interactions compete with each other, therefore the report of induced helimagnetism in a simple cubic cobalt oxide structure, is highly significant. "We have shown emergent helical spin order in a cubic perovskite-type material, which we achieved simply by expanding the lattice size," study first author Hideaki Sakai says. "We were able to control the size of the lattice expansion by using a high-pressure technique to grow a series of single crystals with particular chemical compositions. Changing the amount of different ions in our materials provided us with sufficient control to investigate the magnetic properties." Systematically replacing strontium ions in the structure with larger barium ions caused the lattice to continually expand until the regular ferromagnetic magnetic order present at room temperature was disrupted, resulting in helimagnetism. These experimental findings were successfully supported by calculations. "The fact that we were able to largely reproduce our findings by first principles calculations verifies that the magnetic interactions in the materials are highly sensitive to the lattice constant," Sakai says. "The more we can understand about the magnetic behavior of crystalline materials, the closer we move towards translating their properties into useful functions. We hope that our findings will pave the way for novel sensor applications." The control of magnetic order simply by changing the lattice chemistry, as demonstrated by this research, provides a foundation for investigating the properties of many other crystalline materials.